(FOODBABE.com) I’ve always loved cereal and as a child I downed bowls of Golden Grahams for breakfast and sometimes dinner too. When I grew up, I ate Fiber One on top of my yogurt while sitting in my cubicle at work. I thought it was very healthy for my body (because of all that fiber and would help me lose weight), and just didn’t understand why I didn’t look and feel my best after eating it. Thankfully I found much healthier cereal later in life but before I tell you about my favorite kinds, we must discuss what is really going on in the “healthy cereal” industry. It’s estimated 94% of us have cereal in the cabinet – but a century ago hardly anyone did. Cereal was the first processed food, making life easier for Americans (and now for people all over the world). Cereal requires no cooking, no skills, and it’s just about as easy as you can get. We want everything to be quick and easy, and this has become an epidemic in this country. This is why cereal has been called the biggest success story of the modern food industry, and as put by author Michael Pollan, “Breakfast cereals in many ways are the archetypal processed food product of modern capitalist food economics”. Millions of dollars are spent on advertising cereal every year, and while most of it aggressively targets children, they heavily advertise to adults as well – from Trix “Silly Rabbit” commercials, free prizes, online games (advergames), celebrity endorsements, product placements, and the marketing messages on the box – we are inundated with their marketing messages every day. It’s all done to make us believe that we don’t have time prepare real food for our families and that their vitamin-fortified creations will give us (and our kids) the energy we need to get through a hard day. But, when you take a hard look at cereal, what is it really? In reality, the cereal industry is making billions selling us cheap commodities like corn and sugar, mixed with cheap additives like artificial colors, dumped into a colorful box with cartoon characters. Mainstream cereals are so heavily processed that they do not have natural nutrients, that’s why most of them are sprayed with vitamins, minerals, and sometimes fortified with protein. It’s the ultimate fake food. The marketing messages on the cereal boxes sure sound healthy: “High Fiber”, “Protein”, “Gluten-Free”, “Low Fat”, “All Natural”, “Essential Vitamins” and “Good Source Of (insert vitamin here)”. But, is cereal really good for us or is it just processed junk food? 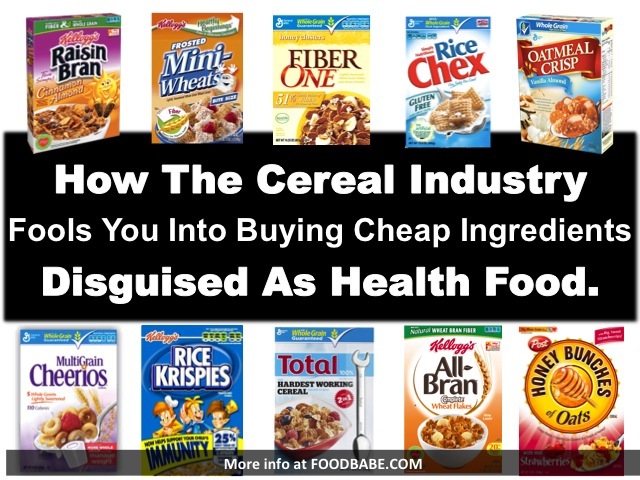 Several “healthy” cereals contain questionable additives that should never be in a healthy breakfast. BHT – This preservative has not been proven safe, controversial research links it to cancer, and it’s believed to be an endocrine disruptor that interferes with your hormones. The Environmental Working Group includes BHT on their Dirty Dozen List of Food Additives – making it one of the most controversial ingredients in our food. You’ll find BHT in many cereals including Special K (most varieties), Rice Chex, Oatmeal Squares, Rice Krispees, Life, Fiber One Honey Clusters, Wheaties, and Smart Start. This ingredient isn’t permitted in cereals in Europe, so these brands reformulate their cereals to sell them legally overseas. NOTE: Hopefully this ingredient will be history soon. Sign my petition here asking Kellogg’s and General Mills to remove BHT from all cereals and ask them to provide us with a date! Artificial Colors – Derived from petroleum and linked to several health issues, including allergies and hyperactivity in children. This is why Europe requires any food containing these dyes to carry the warning label: “May Have an Adverse Effect on Activity and Attention in Children.” You’ll find artificial colors in a lot of cereals targeting kids like Captain Crunch, Apple Jacks, and Fruity Cheerios, but even in cereals you’d never expect like Life Cereal, Kellogg’s Smart Start, and Special K Fruit & Yogurt. Kellogg’s: “Since the majority of our ingredients come from U.S. farms and GM crops have been grown in the U.S. for the past 20 years, our foods likely include ingredients derived from GM crops in the same proportion that they occur in the U.S. food supply.” – via email, February 2015. NOTE: Kellogg’s has spent over $1.8 million to fight GMO labeling initiatives in the U.S.
General Mills: “Because U.S. farmers use GM seed to grow certain crops, 70 percent of foods on U.S. grocery store shelves likely contain GMO ingredients. As a result, if an American food or beverage product lists corn, soy, canola, cottonseed or beet sugar as an ingredient – and if it’s not organic – it likely contains GMOs.” – via their website, February 2015. NOTE: General Mills has spent over $3.6 million to fight GMO labeling initiatives in the U.S.
Quaker: “We do not require or exclude the use of these ingredients, so we don’t require our suppliers to provide this information. As a result, we cannot give you a definitive yes or no answer. That said, we’re glad for the chance to provide some clarification about genetically modified ingredients. When it comes to safety, the FDA has determined that foods developed through this process are no different than foods developed by traditional plant breeding. And in fact they conclude that these Genetically Modified foods don’t differ from other foods in any meaningful way. Finally, all of our products (worldwide) comply with all applicable food laws and labeling requirements. Quaker relies on and supports the regulatory agencies charged with safeguarding our food supply when sourcing ingredients for our products.” – via email, February 2015. NOTE: Quaker’s parent company, Pepsico, has spent over $8.8 million to fight GMO labeling initiatives in the U.S.